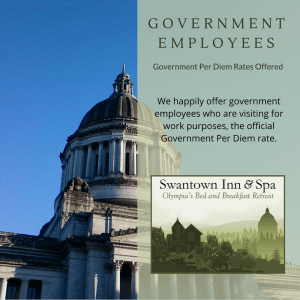 Celebrate by holding your wedding, elopement, renewal of wedding vows, or commitment ceremony in the timeless elegance of Olympia’s Swantown Inn & Spa. Whether your dream has been a romantic garden wedding, or an intimate candlelit affair, the Victorian grandeur of the Inn will provide the perfect setting. We can accommodate 60 guests for either an indoor or outdoor wedding. We even have non-denominational ordained officiants on staff who can assist you in creating a ceremony that is uniquely your own. Our new event space, the Grand Victorian Ballroom, can accommodate up to 60 people. It features a bar area, serving espresso. We can also organize caterering your wedding, or provide you with a list of local trusted caterers. We Specialize in Elopements in Olympia! For a more intimate approach, consider eloping with your loved one at Swantown Inn. We provide the officiant, cake, sparkling beverage, small bouquet and a night in the Astoria Room. 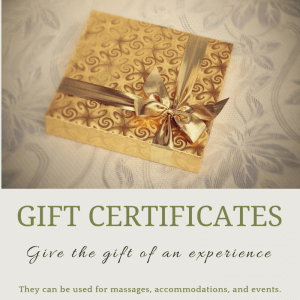 We can handle all the details or your personal touches can make the event distinctively yours. Just be sure to bring the rings and marriage license! If you are on a budget, looking for something simple yet romantic, then an elopement might be for you! You are romantics at heart! You want to keep it small. You want something nicer than the courthouse. You want to combine a short Honeymoon with your wedding (look at our Deluxe Elopement). Las Vegas just does not do it for you! Please see our Olympia Weddings Web site for more details on the costs and our policies regarding holding a wedding at the Inn.